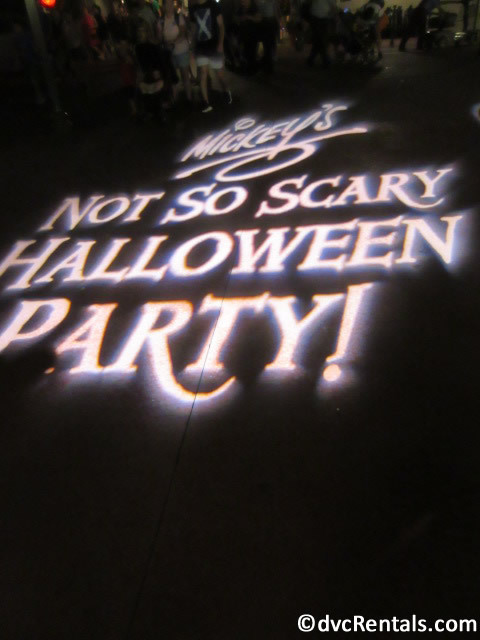 Mickey’s Not So Scary Halloween Party is one of my favorite events at Walt Disney World. I attended the first time in 2005, and it was love at first sight. The entire Magic Kingdom is creepy and fun, especially once the sun goes down. The party begins at 7 PM, at which time all guests without party tickets must exit the park. 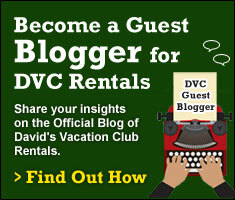 Those with tickets will be allowed in as early as 2 PM if you are a Disney Vacation Club member (bring proof), or 4 PM if you don’t have a DVC membership. 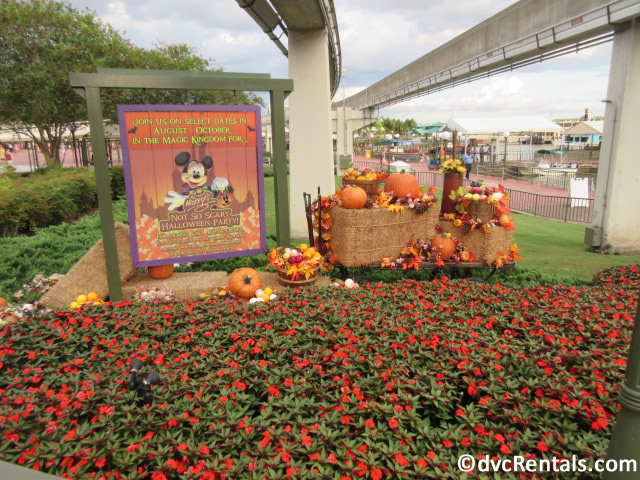 It’s a nice bonus and will give you time to enjoy some of your favorite attractions before the Halloween Party starts. Once the party starts, there is so much to do and see that most guests won’t want to ride the majority of the attractions that are running. If you have arrived just as the party is starting (as opposed to arriving early as described above), you will enter the Magic Kingdom, and Cast Members will direct you to a backstage entrance. Located between Tony’s Town Square Restaurant and the Chapeau Merchandise shop, a gate that is normally closed to guests will be open. Colorful signs are greeting you as you enter this area. 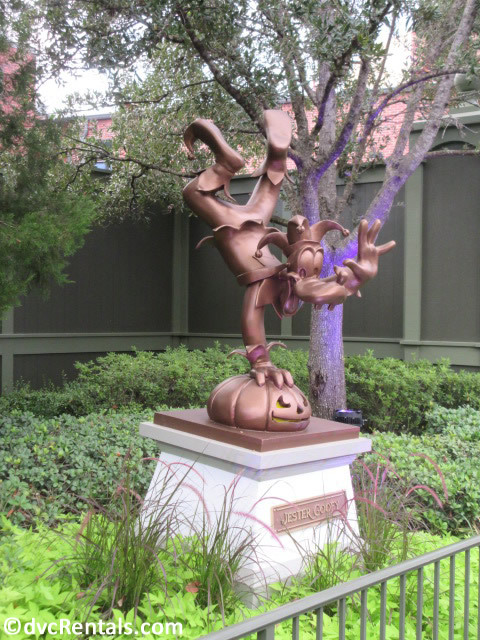 You will pass by some cool statues of Goofy, Donald, Mickey and Minnie that are all Halloween themed. A Cast Member will hand you your first bag of treats, as well as an empty bag to hold the treats you can collect later. They all look very happy to be there and are very welcoming to guests. Continuing on backstage, you enter the Magic Kingdom in Tomorrowland, in the area near the castle where the Dessert Parties are held. 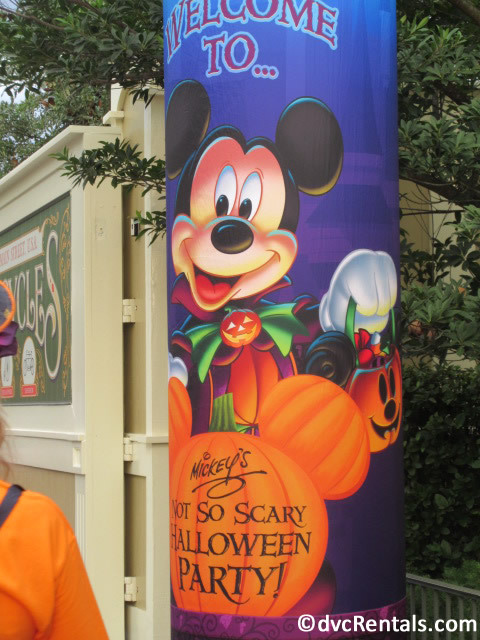 You will have been issued a wristband when you entered the park with your Halloween Ticket, and Cast Members will check to be sure you have the band on to allow you to proceed further. (If you got there before the party started there are a number of locations to get a wristband. Ask any cast member where to find one). Oh, by the way, when you first get to the Magic Kingdom be sure to get a guide map especially printed for the party. The map will tell you where and when to find all the events going on. TIP: These maps are available on many internet sites. If you want to plan your evening in advance, Google to find the 2018 Mickey’s Not So Scary Halloween Party map. You can find party merchandise for sale in a number of places, the same for food and beverages. A number of these things are available only on nights of the party, such as pins and shirts and desserts you cannot buy otherwise. Stores with special Party Merch include the Emporium on Main Street USA; A costume store at Curtain Call Collectibles (next to Town Square) and the Frontierland Trading Post (pins only). The Halloween themed desserts are plentiful and can be found in almost every land. 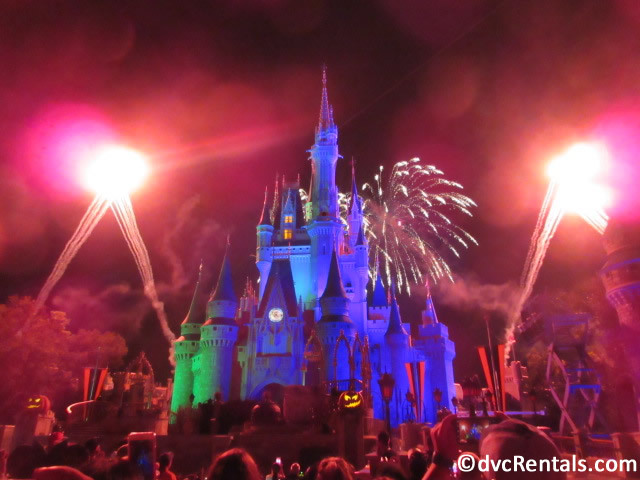 There is a special viewing area for the fireworks if you pay $84 extra to be part of the HalloWishes Dessert Party. I did not attend this, so I cannot report on what it was like. I stuck to the free candy, which was abundant. There were Treat Stations in every one of the lands in various places in each land. The guide map will help you find them. One thing that was new to me (I haven’t been to the party in a few years, so I am not sure when this started), was many of the treat stations being inside attractions/restaurants that are not running/serving food during the party. They used to all be located outdoors. For example Philharmagic, Cosmic Ray’s Restaurant, Carousel of Progress, Monsters Inc, Country Bear Jamboree, Splash Mountain and the Colombia Harbour House are just some of the indoor treat stations to be found at the party. 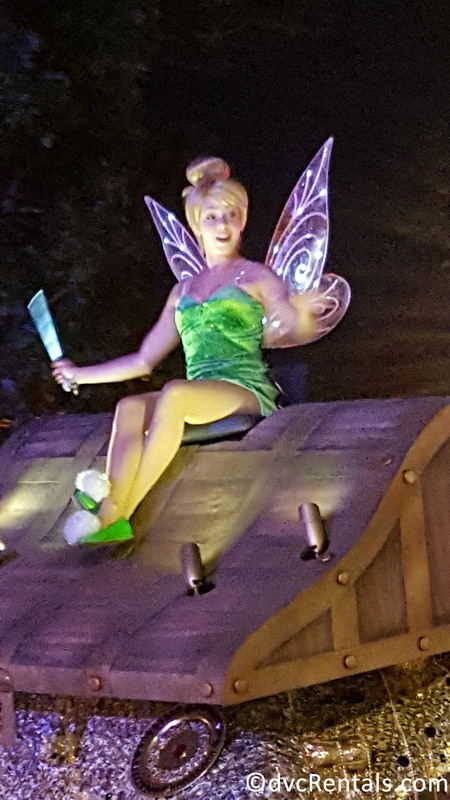 It was fun walking through the attractions, and also a nice break from the heat, as it was a very warm humid night when I attended. BTW for those with allergies, there is a special teal colored treat bag you can request at any treat location. Instead of candy, Cast Members will add tokens to your bag. When you’re ready, go to Town Square Theater or Liberty Square Ticket Office (near Hall of Presidents) to swap your tokens for allergy-friendly treats. TIP: Do not get in line for treats when you first arrive. The lines will be very long. Wait at least two hours into the party, the later the better. The lines will be much shorter, and often the Cast Members will be more generous as the night goes on. The treats were excellent quality, all name brands and a very nice variety as well. Examples include (but not at all limited to) Milky Way (both milk and dark chocolate); Dove minis; Snickers (standard and peanut butter filled); M&M (regular and caramel varieties); Twix (chocolate and white chocolate); malted milk balls, gummy worms, Skittles. For those with Photopass do your best to make some time to take some very special magic shots, only available at the party. You’ll find photographers in front of the Train Station before you enter the park; on Main Street USA; Town Square; and by the Haunted Mansion in Liberty Square. TIP: There is a place to take a picture by the hearse in front of the Haunted Mansion. It’s a great photo and well worth waiting for if it’s not too long a line. But there is a less obvious place where you can be in a really fantastic photo. Most guests were unaware of it the night I visited; the line was very short. I wasn’t even sure what the picture was going to look like, because you sit in front of a black box and it doesn’t look very interesting. However to my delight and surprise when I got the Photopass shot back, there was a scary looking ghost holding a hatbox with MY HEAD IN IT! 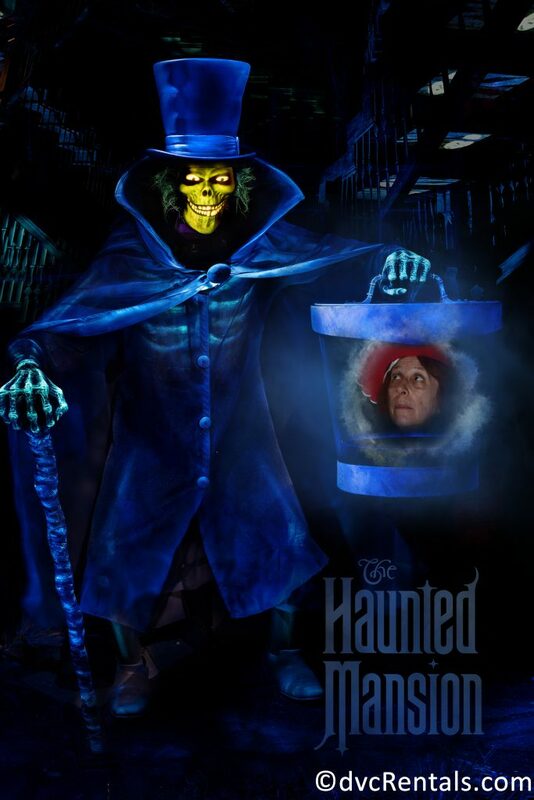 If you know about the hatbox ghost, all the better, but if you don’t, it’s still an awesome photo. 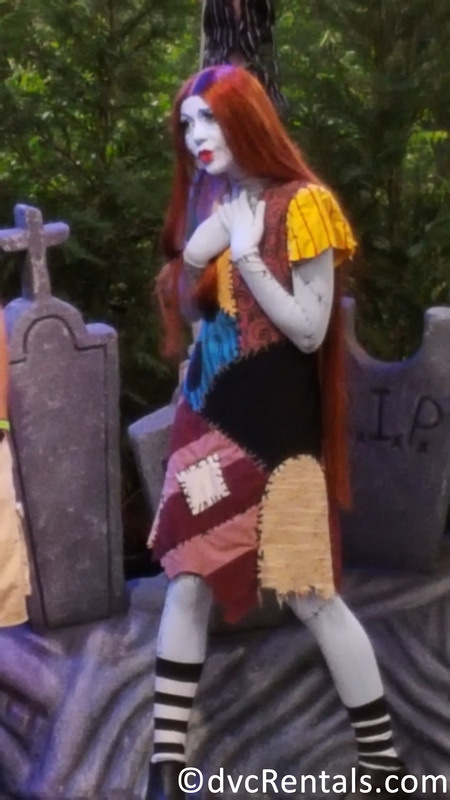 There were also many Character Meet and Greets, the most popular being Jack and Sally. 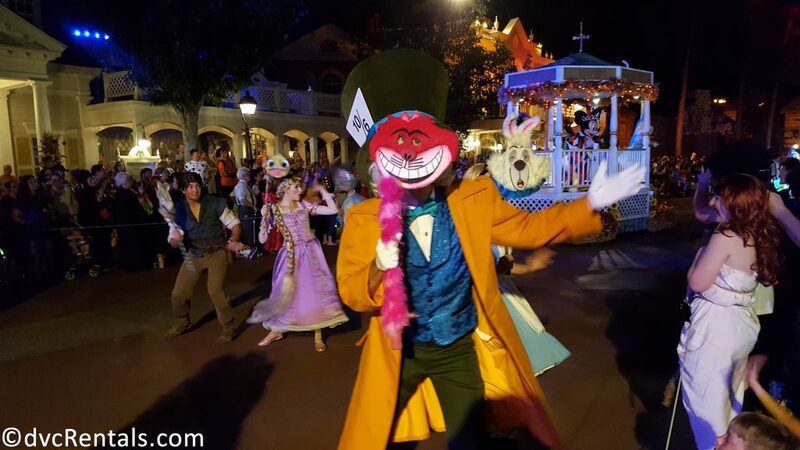 If you are a fan of the Dapper Dans (or even if you’re not), I highly recommend you checking out the Cadaver Dans. The Dans dress up as ghouls (one even has an axe in his back!) 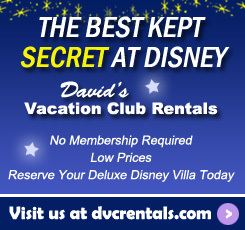 and sing great Disney Halloween songs such as Grim Grinning Ghosts from the Haunted Mansion. They are very funny as well. 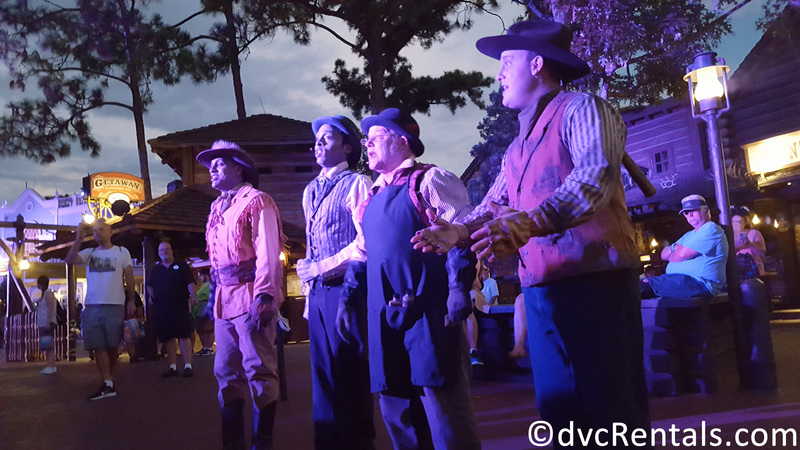 You can find them in Frontierland at 7:00, 7:45, 8:30, 9:50 and 10:30. Other entertainment includes a Dance Party in Tomorrowland (kid-oriented); a very spooky and funny lady seated and talking to guests on the lawn of the Haunted Mansion (another personal favorite, you will need to get in queue for the attraction to see/hear her); Boo To You Parade; HalloWishes Fireworks; Hocus Pocus Villain Spectacular (at the stage in front of the Castle—times vary according to date of the party, so check your guide); and, for the littlest guests, there is the Storybook Circus Disney Junior Jam and the Frontierland Promenade (a place for the kiddies to show off their costumes and be rewarded with candy). 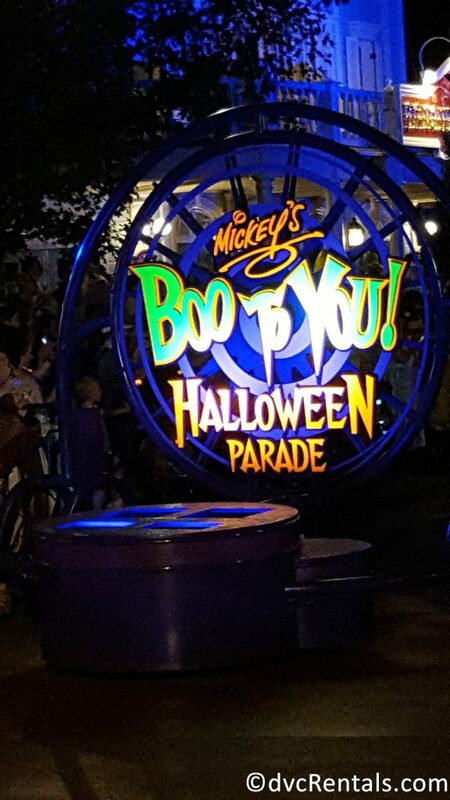 There are two showings of the Boo to You Parade, one at 9:15 and one at 11:15. The second one is always less crowded. However, I am an early bird, so I attended the first showing. I arrived at 8:30 to Frontierland and got a great spot right in front. I like to watch from there because that is where the parade originates and it will pass by there first. So once it goes by you are free to do other things and make the most of your night; it is also less crowded there in my experience. Main Street USA and the hub by the Castle are usually the packed spots. 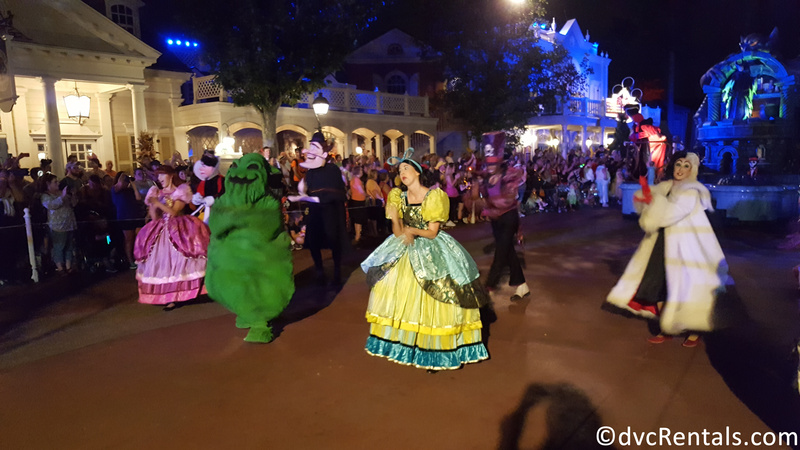 Boo to You is simply fantastic; the best parade I have ever seen at Walt Disney World in my opinion. There are floats from “scary” attractions such as Pirates of the Caribbean and the Haunted Mansion, as well as fun floats that will make you smile. In addition to the floats costumed Cast Members dance and put on fabulous shows as they pass by. 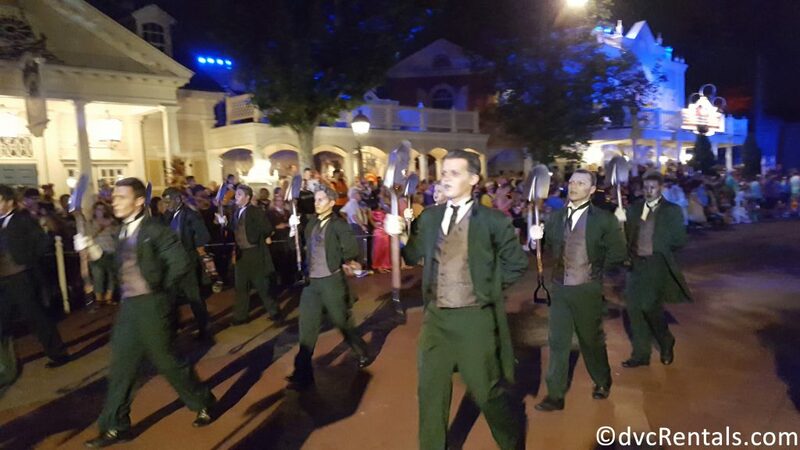 For example, the Haunted Mansion float is accompanied by “gravediggers” who do a ghoulish dance, and as part of the dance, they scrape the shovels they are holding on the ground in unison. This creates sparks flying around, and it looks fabulous. 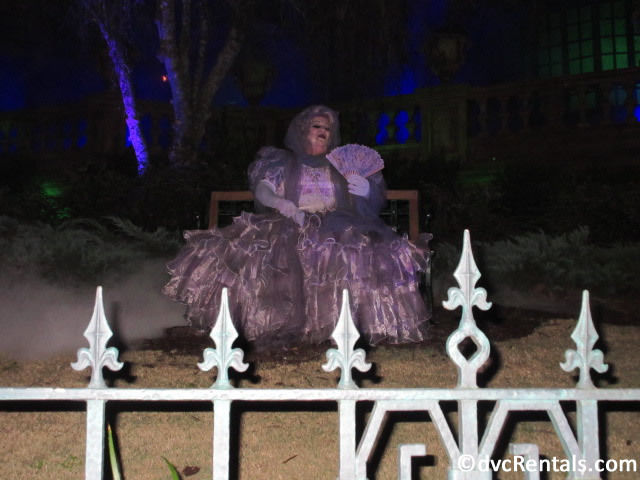 There are also creepy looking dancers from the ballroom scene in the Haunted Mansion, dressed in tattered gowns and suits. Space limits describing each float but you will see many of your favorites along with some characters that are rarely seen. All of them are wearing Halloween costumes. Included are Mickey, Minnie, Donald, Daisy, Alice in Wonderland characters, Pooh characters, Disney Prince and Princesses, Villains (including Oogie Boogie; Cruella Deville, Jafar, the Queen of Hearts and Cinderella’s Step Sisters); Peter Pan characters, Jack Sparrow, Clarabelle Cow; Clara Cluck, Chip & Dale, Country Bears, and Splash Mountain Characters. I cannot emphasize enough that if you go to the party, you really should see this parade. By the way, besides getting a good spot, there is another reason to arrive early to the parade. About ten minutes before it starts, the Headless Horseman rides the parade route, holding a glowing pumpkin. It is a sight to behold! 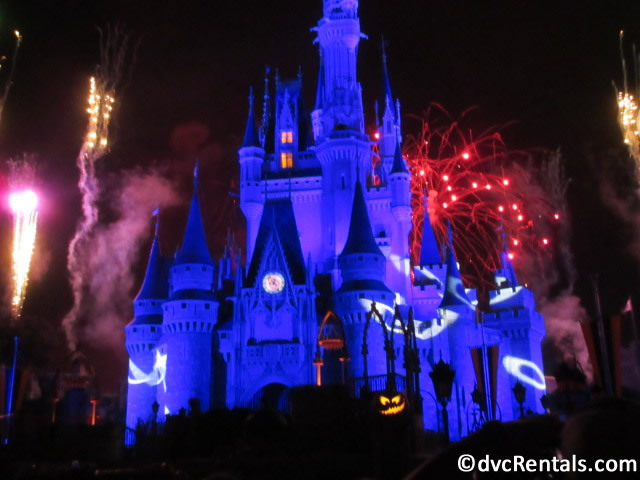 The other “must-do” for most guests is HalloWishes, the wonderful fireworks show, held at 10:15. 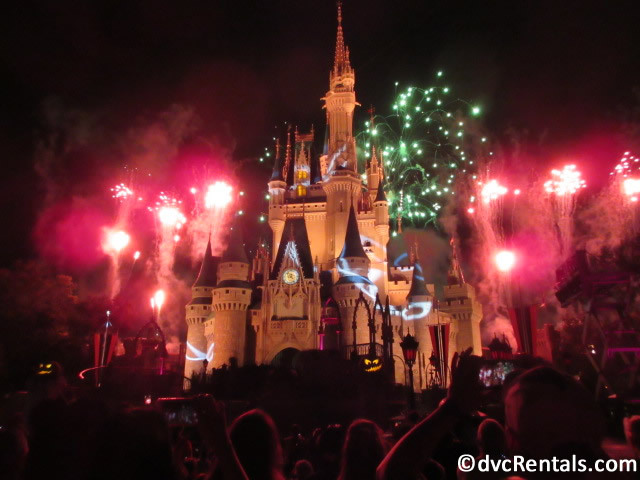 Not only are there fantastic colorful fireworks, the entire castle is lit and changes scenes during the show. I made sure to get there about 30 minutes before showtime, and I got a great spot. If you have a large party, you probably should arrive earlier if you want to be up front. TIP: This show includes some perimeter bursts. If you want to be sure to see them all, don’t stand too close to the castle. About halfway between the Castle and Main Street (the end by Casey’s Corner restaurant) is perfect. A few final words: don’t think because you are an adult it’s inappropriate to wear a costume, most everyone does (I was Jessie from Toy Story). However, you are not allowed to wear anything that will obscure your face or something that is risqué. It’s a lot of fun to get into the spirit of things by dressing up. Also, the party has definitely become more popular as the years have gone by. If you went years ago expect a different experience, Disney seems to have raised the number of tickets sold per night. The closer it gets to Halloween the more crowded the party will be, some nights are already sold out. Lastly, if you want to meet a lot of characters, you may have to give up watching the parade or the fireworks. We all have favorite things to do, so I highly suggest you make a plan ahead of time. Five hours may seem like a long time, but it goes very fast when you’re having so much fun, and there is so much to choose from!